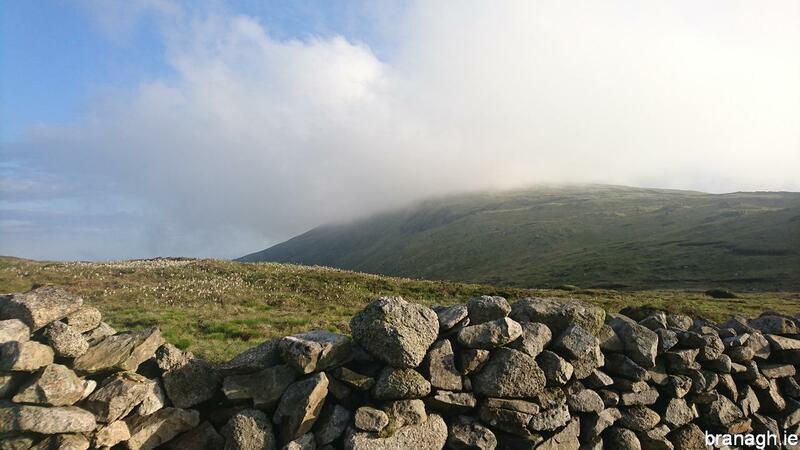 Continuing my way around the Mourne 500’s for summit camps I thought of Slieve Muck. It had been at least two years since I had been on the summit of Slieve Muck but I remembered it having probably the largest flat area of any of the summits. There would be absolutely no problem finding a spot to pitch the tent. As usual I set off after work and headed for Ott carpark. Initially there was a little cloud sitting on the summits but otherwise the weather was perfect; light wind and mild temperatures. I ventured up Ott Track and around behind Ott Mountain below Carn Mountain toward Slieve Muck. There was some quite boggy ground underfoot but thankfully no match for my boots. The cloud began to clear a little more and I had a nice view to the right across Spelga Dam. I enjoy that route to the summit of Slieve Muck. It is quite long and gradual. 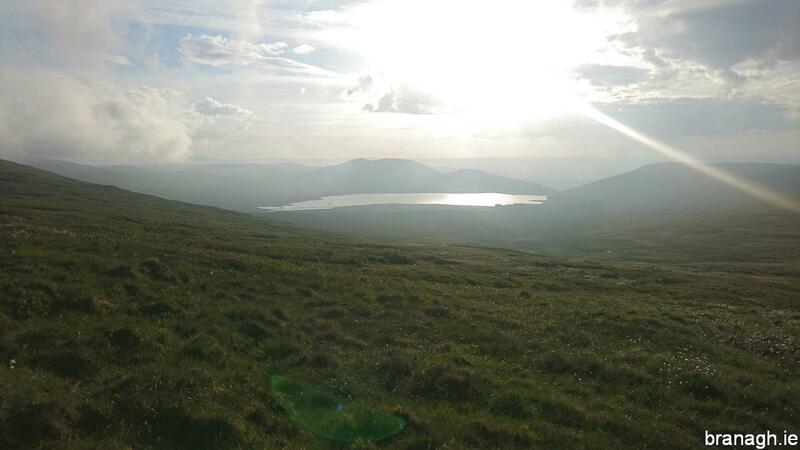 There view over Spelga Dam on the ascent. There was some cloud on the summits while I was ascending. I pitched the tent looking north west toward the rest of the Mournes. Once on the summit it took me a little while to decide where to pitch the tent. I was totally spoiled for choice. Eventually I decided on a spot looking north west into the rest of the Mournes. By this stage the cloud had cleared completely from the summit and it was an absolutely stunning evening. I went through the usual routine of pitching the tent, inflating my Thermarest and unrolling my sleeping bag. 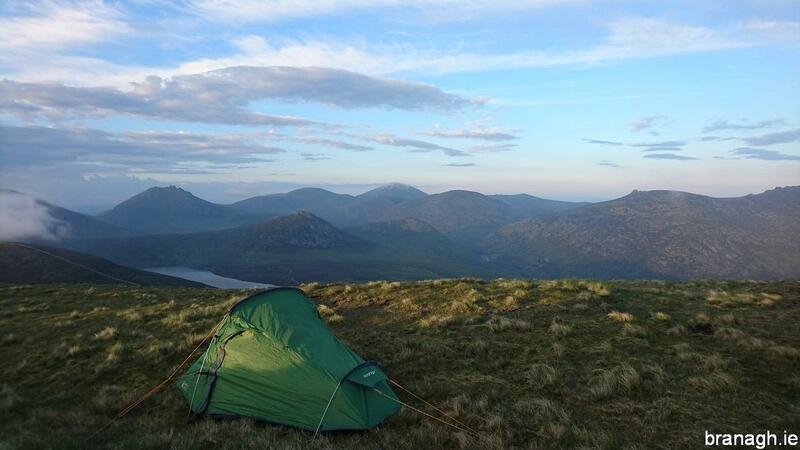 Once I had the camp set up I zipped up the tent and headed off for a walk around the summit. It was a stunning evening as the sun was beginning to set in the west. I took some photographs with my phone and wished (as I sometimes do) that I had an expensive camera and the skill to properly use it. The sunset was fantastic. With light wind and mild temperatures sleeping was not a problem either. 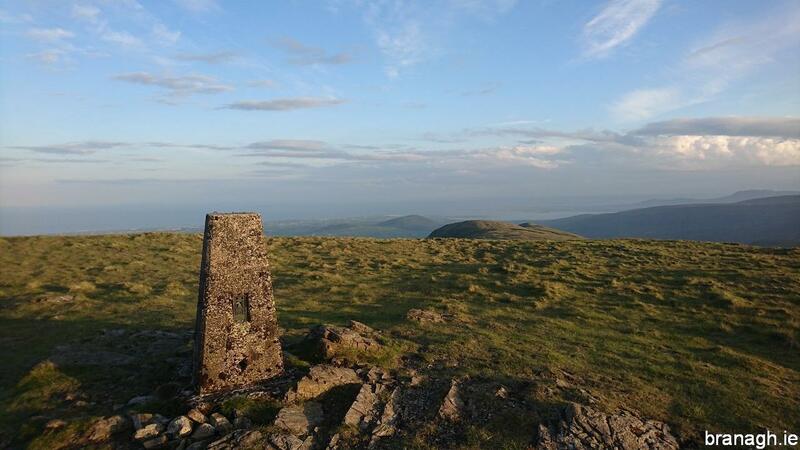 The view to the south from the trig point on the summit. 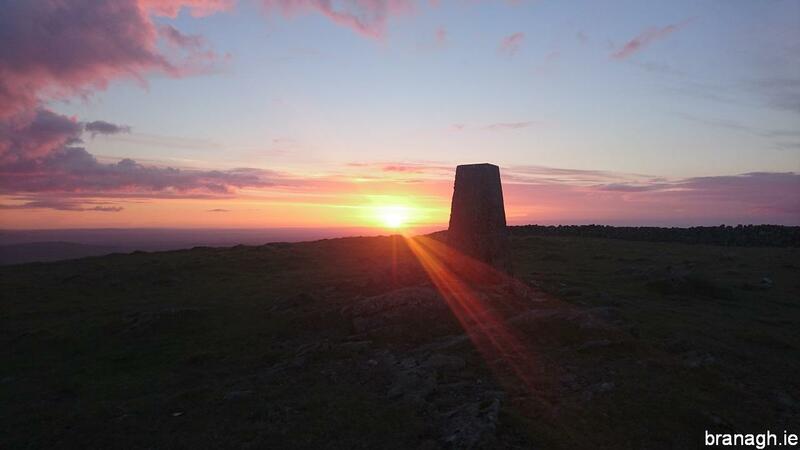 Sunset to the west behind the summit trig point. The next morning I decided to descend from Slieve Muck directly down to the south of Ott mountain instead of Ott track to the north. This route was very boggy all the way down almost to Moyad Road. Thankfully though my boots were still fully able to cope.